On 16 January civic activist Mark Galperin was sentenced to 38 days in prison for ‘taking part in a public event for which notification had not officially been given’. 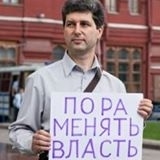 The sentence was for demonstrating on Manezh Square in support of Charlie Hebdo on 10 January (holding up a placard ‘Je suis Charlie’), and also included a penalty for taking part in a demonstration on 15 January on Manezh Square in support of the Navalny brothers. Vladimir Ionov, a pensioner, who also took part in both demonstrations, was fined 20,000 roubles for taking part in the demonstration in support of Charlie Hebdo and 150,000 roubles for taking part in the demonstration in support of the Navalny brothers. Civic activist Ildar Dadin was sentenced to 15 days in prison.